The Global Volcanism Program has no activity reports for Bakening. The Global Volcanism Program has no Weekly Reports available for Bakening. The Global Volcanism Program has no Bulletin Reports available for Bakening. Bakening (also known as Bakenin) lies well west of the eastern volcanic range of Kamchatka, at the head of the Srednyaya Avacha River, about 100 km NNW of Petropavlovsk. 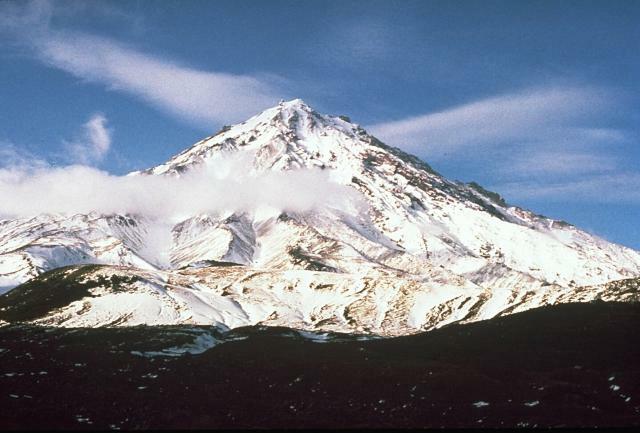 Most of the volcano is of Pleistocene age, and subglacial rhyodacitic tuyas are located on the NW flanks. The andesitic stratovolcano has dacitic lava domes at its N and NE base, the latest of which (Novo Bakening) formed about 9000-10,000 years ago. A large horseshoe-shaped depression on the SE flank was the source of a large debris avalanche about 8000-8500 years ago that traveled 11 km E and S. The avalanche, which dammed drainages forming two lakes NE and E of the volcano, was followed by an explosive eruption and a block-and-ash flow. Several late-Pleistocene to Holocene cinder cones are located on the northern-to-southern flanks. The latest dated activity consisted of the construction of a cinder cone at the western foot of the volcano about 2500 years ago. Braitseva O A, Pevzner M M, 2001. Novo-Bakening volcano of Kamchatka: its age and tephra stratigraphy. Volc Seism, 22: 581-594 (English translation). Dorendorf F, Churikova T, Koloskov A, Worner G, 2000. Late Pleistocene to Holocene activity at Bakening volcano and surrounding monogenetic centers (Kamchatka): volcanic geology and geochemical evolution. J. Volcanol. Geotherm. Res., 104: 131-151. Melekestsev I V, Dirksen O V, Girina O A, 1999. A giant landslide-explosion cirque and a debris avalanche at Bakening volcano, Kamchatka. Volc Seism, 20: 265-279 (English translation). There is no Deformation History data available for Bakening. There is no Emissions History data available for Bakening. Three dacitic lava domes form the small peaks in the foreground of this view of the north flank of Bakenin volcano. Andesitic lava flows from the central cone of Bakenin overlie the lava domes. Photo by Pavel Kepezhinskas (University of Southern Florida). Bakening, seen here from the north, is a 2277-m-high stratovolcano NW of Petropavlovsk. The volcano lies near the headwaters of the Srednaya Avacha River, well to the west of the eastern volcanic range of Kamchatka. Dacitic lava domes occur at the base of Bakening. About 8500-8000 years ago the summit of the volcano collapsed, producing a large debris avalanche to the SE. 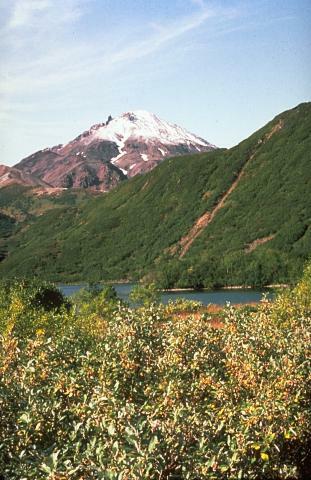 Bakening volcano, seen here from the north, rises above a basement of metamorphic greenschists, which underlie the forested slopes in the center of the photo. The lake in the foreground and another small lake were formed within the metamorphic terrain when landslides dammed river drainages. Andesitic lava flows overlie dacitic lava domes at the base of the volcano, which is located far west of the eastern volcanic range of Kamchatka. Photo by Pavel Kepezhinskas, 1993 (University of Southern Florida). 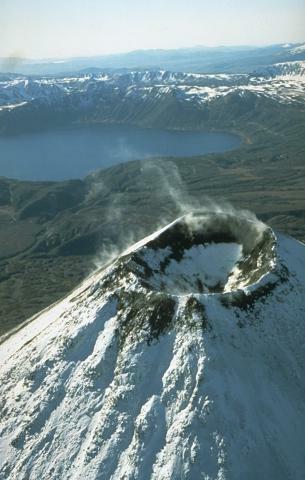 Karymsky volcano contained a 250-m-wide summit crater following the 1970-82 eruption. Karymsky Lake fills the 3 x 5 km wide Akademia Nauk caldera to the south in this early 1990's aerial photo. Both Karymsky and Akademia Nauk volcanoes erupted simultaneously on January 2, 1996. The brief one-day eruption was the first historical eruption of Akademia Nauk, but long-term explosive activity continued at Karymsky, one of Kamchatka's most active volcanoes. 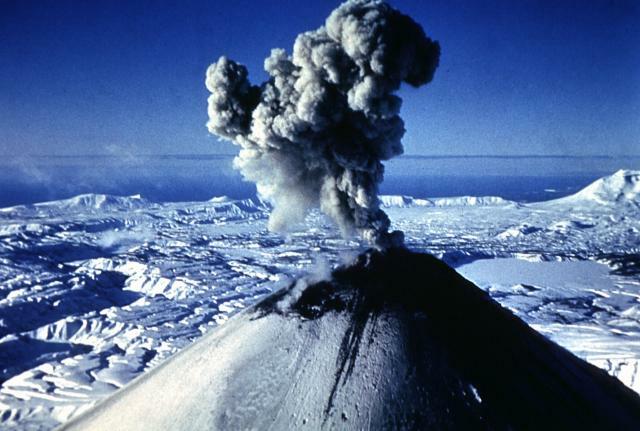 An eruption plume rises above the summit of Karymsky volcano in January 1996. Explosive eruptions began on January 2 from the summit and SW flank of Karymsky volcano. On the same day a powerful explosive eruption took place from Akademia Nauk (Karymsky Lake) caldera, the circular, smooth-textured area to the right of Karymsky's summit. The Akademia Nauk eruption lasted only a day, but long-term activity continued at Karymsky. 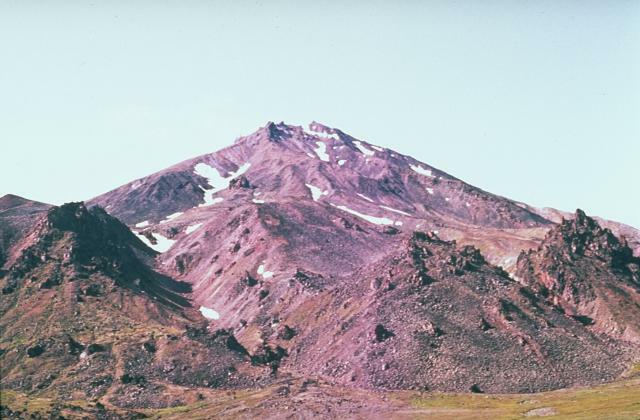 Photo by Nikolai Smelov, 1996 (courtesy of Vera Ponomareva, Institute of Volcanic Geology and Geochemistry, Petropavlovsk). There are no samples for Bakening in the Smithsonian's NMNH Department of Mineral Sciences Rock and Ore collection. Large Eruptions of Bakening Information about large Quaternary eruptions (VEI >= 4) is cataloged in the Large Magnitude Explosive Volcanic Eruptions (LaMEVE) database of the Volcano Global Risk Identification and Analysis Project (VOGRIPA).